Meet Mio, a 21-year-old student at Japan’s most prestigious fashion school, Bunka Fashion College. These street snaps were taken near the Bunka campus in Shinjuku. Mio is wearing a blazer she picked up resale over two layered resale graphic tops, a long pleated sheer skirt from Nadia Harajuku, graphic leggings, and creepers she bought resale (they might be George Cox based on the British flag tag). 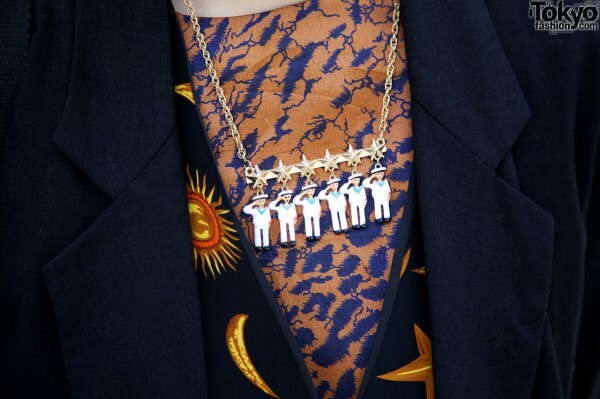 Accessories – most of which were also purchased from Tokyo resale shops – include a cute necklace with little sailors on it, multiple earrings, a silver studs ring, a vampire fangs ring, a Casio G-Shock watch, and a studded shoulder bag from the Japanese brand Jeanasis. Mio’s favorite fashion designer is Vivienne Westwood and her favorite musical group is the Japanese rock band Shakalabbits. because i have a pair with the same tag ..
well THAT look is admirable. 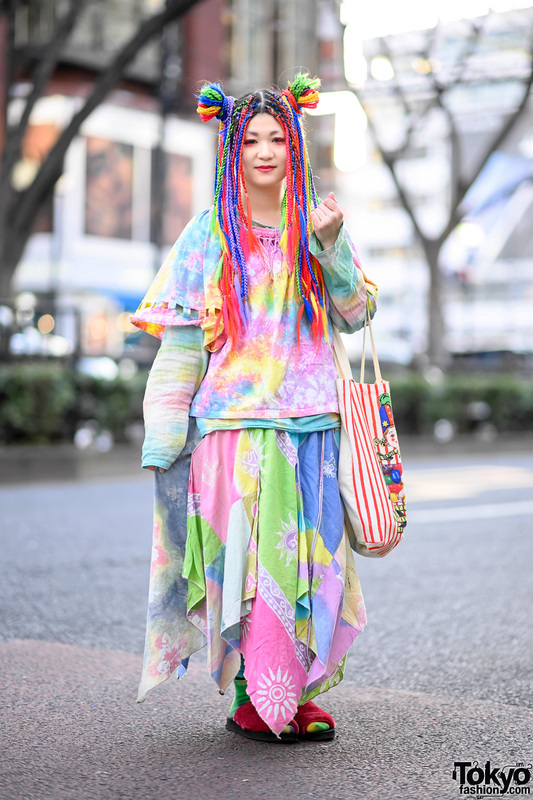 sometimes i think that japanese fashion people loose sense of what is over the top in a good way and what is not but this girl just prooved me that japanese fashion can be VERY tasteful without loosing in intensity. well done! @Alice – Thanks, that makes sense! Underground even had a popup shop at LaForet Harajuku recently. Love that windy effect. Her skirt and necklace are just adorable! I’d totally wear this. It’s along the lines of the style I like 100%. While everyone is into that Forever21 covergirl look, I will forever be into dark colors, cool, short hair, and that overall classy rocker look. Wow. I love how she layered all those different prints and fabrics and still managed to look sleek!